Presented here, a fine lathe turned Work or Utility Bowl, probably Maple, of a substantial size . . . one of the largest we've had. Lathe marks are visible on both the interior and exterior. Bowls such as this were an important part of the colonial kitchen and had a multitude of uses. The interior of the bowl is exceptionally clean. 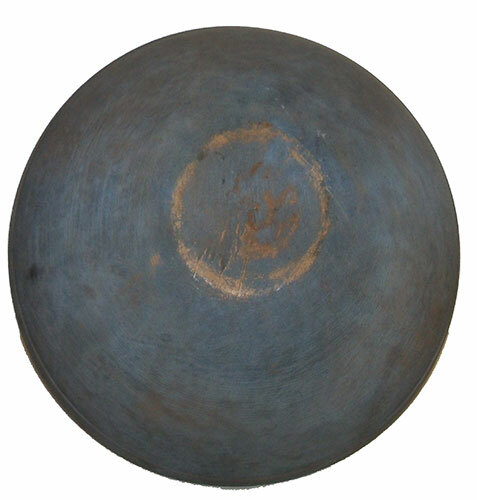 It is 5 inches high and has shrunk slightly out of round measuring 16-1/2 inches in diameter to 17-1/4 inches depending on where the measurement is taken. (Sort of reminds me of a potato chip.) It still retains its original Robin's Egg Blue paint on the exterior which shows wear in all the right places . . . notably the rim and the bottom. The condition is excellent with no cracks or losses . . . Actually in exceptional condition for a 200 + year old bowl! A true survivor to grace your country cupboard or table.